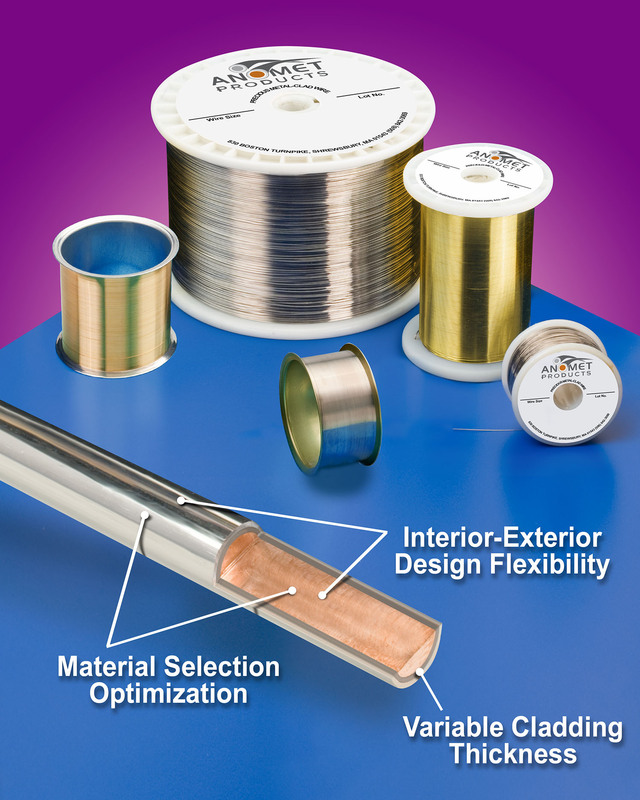 Custom manufactured composite clad metal wire that provide a wide range of options for design engineers with respect to material selection, cladding thickness and diameter are available from Anomet Products of Shrewsbury, MA. Anomet Composite Clad Metal Wire combines up to three materials, each metallurgically bonded together with 2% or more cladding thickness to produce wire that meets performance design requirements and cost criteria. Featuring a gold, silver, palladium or platinum exterior layer, the core and second layer can include copper, stainless steel, Kovar®, niobium, Nitinol®, nickel-iron, molybdenum, tantalum, and titanium. Permitting the design of smaller connectors and implantable medical devices, Anomet Composite Clad Metal Wire can achieve properties not available in a single alloy such as high conductivity, high strength, and biocompatibility or radiopacity. Available from 0.002” to 0.125” O.D., applications include connectors, contacts, implantable medical devices, and micro-switches. Anomet Composite Clad Metal Wire is priced according to configuration and quantity. Samples and price quotations are available upon request.